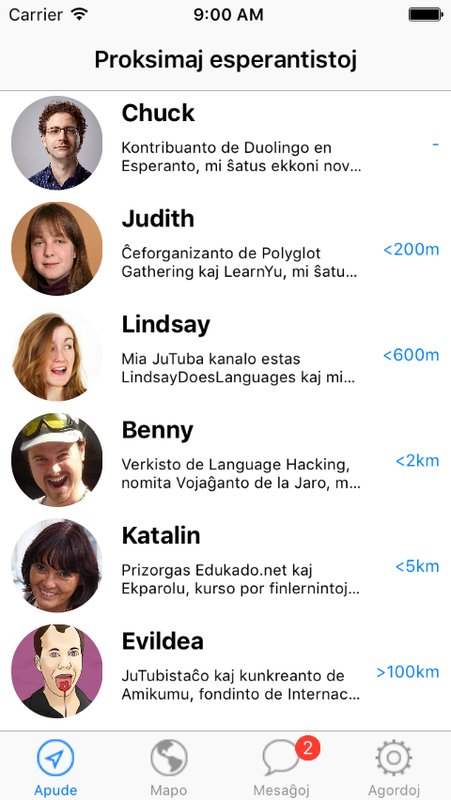 Amikumu, an app to find language partners nearby! I recently created an app to help language learners find language partners nearby! You just open the app, choose a language and see all the speakers of that language near you. We have a Kickstarter campaign and have already raised €18,739, so we have the funds to make the app. According to plan, we'll soft launch to Esperanto speakers in March 2017 and to all of the world's 7,000+ languages (including 100+ sign languages) in July 2017. So, if you like the idea, please support and spread it! Mi lastatempe kreis apon por helpi al esperantistoj trovi unu la alian loke! Vi simple malfermas la apon kaj povas vidi esperantistojn apud vi. Ni havas kampanjon per Kickstarter kaj jam kolektis 18.793€, do ni certe povos krei la apon. Laŭplane, ni lanĉetos ĝin por Esperanto en marto 2017 kaj al ĉiuj 7.000+ lingvoj de la mondo (inkluzive de 100+ signolingvoj) en julio 2017. Do, se vi ŝatas la ideon, bonvolu subteni kaj disvastigi ĝin! Today I just released Random Chess (Chess960) for the iPhone. It will randomize the starting position of a chess game putting your bishops on different colors as well as putting the king between the two rooks. You can already buy it now from the App Store for only $0.99 or see more details on my Random Chess page. You can also see my interviews with iPhone developers: Galcon, BloXoR and Metasquares. Hodiaŭ mi ĵus eldonis Hazardan Ŝakon por la iPhone. Ĝi hazardigos la komencan pozicion de ŝaka ludo metante viajn du kurierojn sur malsamaj koloroj kaj vian reĝon inter viaj du turoj. Vi jam povas aĉeti ĝin nun de la App Store kontraŭ nur $0.99 aŭ vidi pli da detaloj sur mia paĝo de Hazarda Ŝako. Vi ankaŭ povas vidi miajn intervjuojn kun iPhone-programistoj: Galcon, BloXoR and Metasquares. You can now add my new blog as a friend to your LJ account by friending chucksmithweb20. Thanks to jiggery_pokery for setting it up! I explain how here on my other blog. I now keep a professional blog on www.chucksmith.de, but I will continue to post personal news here. Mi nun tenas profesian blogon ĉe www.chucksmith.de, sed mi daŭre afiŝos personajn aferojn ĉi tie. Have you been wanting to learn Korean, but haven't quite gotten around to it? Are those pesky characters mocking you and keeping you from the high-energy thrill of Korean? Fret no more! Just kidding, felt like giving an infomercial spiel. But really, check out a quick and interactive way to learn the Korean alphabet. Verkante artikolojn por Vikipedio ĉiu kontribuanto renkontiĝas kun terminologiaj problemoj, ĉar ne ekzistas fako teknika, scienca aŭ arta, kie ne troviĝus ankaŭ terminoj. Oni verkas pri landoj, urboj, monumentoj, artistoj, sciencistoj, sportistoj, politikistoj, inventoj, eventoj, bestoj, plantoj, mineraloj - ĉie svarmas terminoj, kiujn necesas esprimi en Esperanto.